As the dust settles over the PRU14 battlefield, Pakatan Harapan (PH) will be working on fulfilling the fiscal reform review plan which they announced prior to May 9, which includes consulting prominent Malaysian business leaders, in its first 100 days after taking over Putrajaya. In a joint statement by the coalition's presidential council members, PH said "respected, eminent, patriotic Malaysians" will be invited to contribute in undertaking these reforms. "Some have already agreed to be part of this endeavour, including experienced captains of industry, a former President of Petronas, a successful Hong Kong-based tycoon, respected former senior civil servants and economists. They will provide guidance for the formulation and execution of the reform plan," it said, without giving any names. "Malaysia is blessed with a hard-working and talented workforce, good infrastructure and abundant resources. Irresponsible fiscal policy conduct since 2009, and steady erosion of the quality of our institutions have set the country back. The time for progressive change, not a witch hunt or retribution, is long overdue," it added. 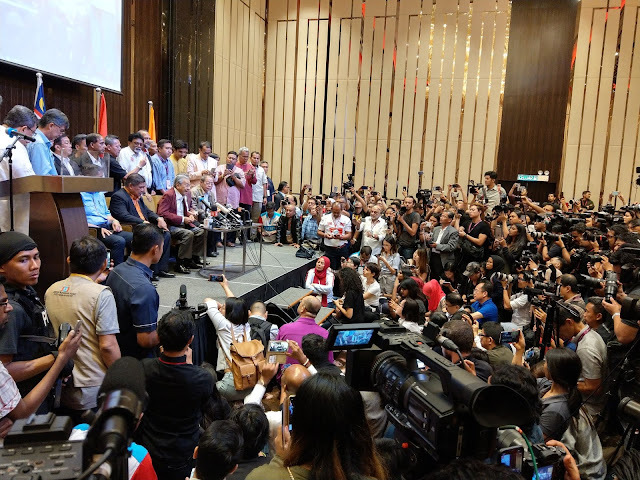 The council comprises PH Chairman Tun Dr Mahathir Mohamad, president Datuk Seri Dr Wan Azizah Wan Ismail, deputy President Tan Sri Muhyiddin Yassin, Lim Guan Eng, and Hj Mohamad Sabu. PH said it will also undertake an evaluation of the responsibilities, commitments, expenditures and liabilities in relation to its revenue, assets and income of the government in the first 100 days of its administration in order to achieve greater fiscal responsibility. The evaluation will focus on three key areas: federal government budget and finances, accrual accounting and asset-liability management, and outstanding government debt obligations — including government guaranteed debt, especially foreign obligations. PH said the review of Federal Government Budget and Finances will cover both expenditure and revenue. The coalition also said it will assess the sovereign risk and capital market management to evaluate and consider better market instruments to manage liquidity and price sovereign risks more effectively. "The treasury function of the Federal Treasury will be enhanced and the pricing of government-guaranteed liability improved. We will come up with a comprehensive reform plan at the end of the first 100 days which will put us back on a path of sustained prosperity for all Malaysians. "Subsequent reforms will seek to ensure fiscal conduct that is more sustainable, inclusive and growth enhancing. This will, in turn, seek to improve the investment climate, reduce the cost of living and doing business, raise national competitiveness and promote greater economic prosperity," it added. Review all major public projects, especially those financed outside of the development budget, and related contingent liabilities. Review incurred future debt-related operating expenditure commitments. Reprioritise publicly funded projects responsibly. Shift expenditure allocations to prioritise general well-being, including social protection for the disadvantaged. Ensure government procurement by open tender. Assess the entire revenue base of the federal government to improve its breadth, responsiveness and progressiveness. Improve accountability of state-owned enterprises and other public assets to enhance efficiency, accountability and revenue contribution. Reduce borrowing and restructure liabilities to ensure greater fiscal sustainability. Fully account for federal government liabilities – both direct and contingent liabilities incurred via government guarantees. Restructure federal-state-local government relations to more equitably share revenues and costs of providing public infrastructure and services. In this regard, special consideration will be given in the spirit of the constitutional commitments made in the 1963 Malaysia Agreement to Sabah and Sarawak. Adopt accrual accounting to better take stock of federal government's assets and improve the asset-liability management framework that would identify mismatches and risk. Evaluate and consider better market instruments to manage liquidity and price sovereign risks more effectively. The treasury function of the federal treasury will be enhanced and the pricing of government-guaranteed liability improved. Hence, PH said it is "fully committed" to undertake responsible and progressive fiscal reforms, to be implemented in an orderly, transparent and systematic manner to enhance fiscal equity, transparency and accountability, and support accelerated productive investments and economic growth. It's a brand new uncharted territory for a lot of us, especially those of us who was born into a country that was ruled by Tun Dr. Mahathir, and see the debacle that happened after he stepped down and now with him leading Pakatan Harapan into Putrajaya. Time is changing and it is exciting.